Discussion in 'Tutorials and How Tos' started by tekering, Jul 7, 2013. 1. How can you claim your own work to be "definitive?" I have done no secondary research, second-guessing relative scales based on animation footage or other sources; I have merely reproduced the characters exactly as they appeared in all the available reference charts. Therefore, this work is above reproach, and not open to fan interpretation. 2. How can you call this "definitive," when [my favorite G1 character] is missing? As it was my intention to reproduce the original scale charts, only characters depicted in archive materials are presented here. None of the Season 2 combiner teams, for instance, appear on any of the available scale charts, and a large portion of the Season 3 cast is absent. 3. How come [my favorite G1 character] appears to be a different scale in [my favorite G1 episode]? Given episodes were being produced for syndication by at least four different studios simultaneously, inconsistencies are bound to crop up from episode to episode (or indeed, within the same episode, with poorly-drawn animation becoming more and more common as the series progressed). The reason these charts were produced to begin with was as a means of avoiding such problems, but there's not much you can do when a studio like AKOM is responsible for the bulk of your animation. 4. Why have you included modern Hasbro labels for toy size classes? Why not? I designated a specific color for each reference line for clarity, and figured the lines ought to be labeled as well. You can judge your Classics, Universe, Generations, or Masterpiece figures accordingly. 5. Do I have your permission to use this image elsewhere? I don't have the authority to tell you what to do with this work; this is not based on any calculations I have done, nor is any of the artwork mine to use. If anyone deserves credit, it's Flory Dery (who did most of the character design artwork) and Jim Sorenson (who gathered and published as much archive material as he could manage). I should also acknowledge Cobalt Agent's contribution, having gathered most of the existing scans into a single post a few years back. If this thread belongs in a different section of the forum, my apologies; I wasn't quite sure what to do with it. I'm unsure as to who many of the characters on this chart are, but this chart would be incredibly useful when setting up my TF collection.....I just need to know who's who! Weirdwolf's Headmaster is named Monzo. Chromedome's Headmaster is named Stylor. Cerebros' Headmaster is Spike Witwicky. Spike's father (top left) is called Sparkplug. Oh, and you've got Grapple and Inferno reversed. Wow, great to see my work has been so well-received. I figured there'd be a demand for it, but not this much! I don't see how Metroplex can be so small? They are inside him several times. Hell, they even manage to fit in Huffer! Clearly, alt. mode scales are totally irrelevant to this discussion. If I may ask, though, considering the discrepancy in size for combiners in the scale charts themselves, would it not be better to scale Trypticon and Metroplex from Rodimus Prime than Predaking? 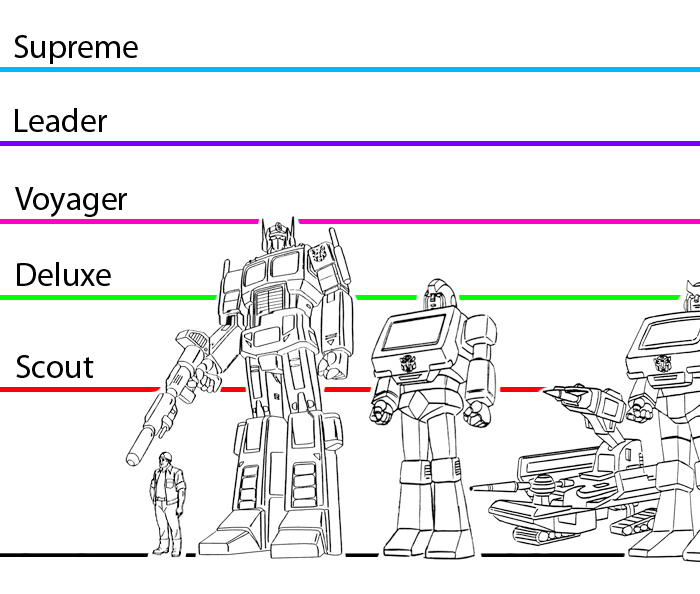 As you pointed out with the Season 2 Omega Supreme chart, the cut-and-pasted Optimus is clearly too large; I rejected the inconsistently-scaled Rodimus next to Predaking for the same reason. More importantly, the next-largest object should always be the primary basis for assessing scale, as it's the most effective way of confirming accuracy. Ignoring Predaking's height and focusing solely on the tiny Rodimus would not only increase the margin of error, but result in an even smaller Metroplex than what the chart represents (and indeed, how he and Trypticon are depicted in the animation). I'm extremely happy to have your feedback, however, as someone who's been down this path before and knows how difficult it is to stay objective. The temptation to rely on visual evidence from specific episodes, statistics from secondary sources, and other supporting data (though ultimately irrelevant) is great... but I have striven to maintain complete objectivity. I didn't realize Springer was so much bigger than his pals. That's because he wasn't consistently depicted that way... presumably because the toy turned out to be smaller than his pals. It does make it easier to justify a Voyager-class Springer on your Classics shelf, though. As a request, on your free time when you have nothing to do. Is it possible to cut the master file into 3 files by arranging each file into their respective season (1,2,3) and faction (Autobots on top and Decepticons on bottom) in order to reduce the file size and cutting down the scrolling of horizontal direction of the computer screen? Sure, Remy... in my free time, when I have nothing to do. By the way, your galleries are legendary. Did you ever reach the big 500? Now we need a MP scaled Trypticon! At Masterpiece scale (consistent since MP-10), Trypticon would stand about seven feet tall. You'd probably need an Olympic weight-lifting team to transform him. I have scans of all G1 character designs from the Ark books, including Ark II (Headmasters, Masterforce, Victory,....). Would you like to collaborate on an un/official Japanese G1 scale project? While I believe the heights may be the same for the headmasters in the Jap-US media, the character models you used are of their Japanese counterparts. Well-spotted, my friend. The character models published in the Ark (presumably provided by Sunbow) were of such poor quality that I substituted the Japanese models for most of the Headmasters. I'm sure the heights for the Headmasters themselves would be about the same, but the Nebulan partners seem too big to me. I think they should be slightly if at all taller than an average 6ft. adult human. That's why I've attempted to stay completely objective, and stuck only to the officially-published scales. Furthermore, if asked to choose between The Headmasters (a 35-episode series produced by Toei Animation) or "The Rebirth" (a three-episode serial produced by AKOM), The Headmasters will always come out on top. It led G1 through a Japanese renaissance that continued for years, whereas "The Rebirth" led Hasbro to pull the plug entirely. Japanese fans got over a hundred more G1 episodes -- more than were ever produced in the US to begin with -- and a greatly-expanded mythology that included Pretenders, Brainmasters, and Godmasters. American fans got a year of re-runs and Tommy Kennedy. This is why, like most Japanese fans, I ignore "The Rebirth" entirely. I think Sunbow itself was only involved with the western/Marvel portion of the franchise. So if you're going by The Headmasters' scale, it'd be wrong to call it the definitive Sunbow scale rather than merely the definitive Japanese scale thread. Damn, you're right. I probably should omit the Headmaster characters entirely, then... since I can't change the thread title. I'm not the legendary Remy Rhodis of Hong Kong with the marvelous galleries. My apologies; being a Transformers fan named Remy, I assumed you must be TFKenkon. I have a bad habit of jumping to conclusions like that. You must be that Headmaster mouse from Ratatouille, then. I know this is a huge request, but im gonna throw it out there anyways: if someone is bored and has some free time on their hands, can he/she help me put names to these figures. I love me some Transformers, but I'm more of GI Joe collector than anything else. I'm unsure as to who many of the characters on this chart are, but this chart would be incredibly useful when setting up my TF collection.....I just need to know who's who! Here you go. There are two near the bottom that I don't know. It's nice but I don't see how Metroplex can be so small? I applaud Tekering's efforts here. 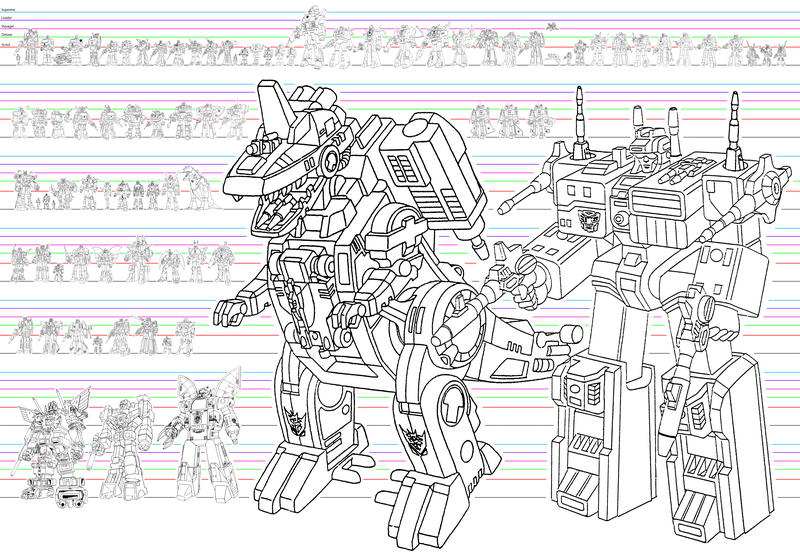 If I may ask, though, considering the discrepancy in size for combiners in the scale charts themselves, would it not be better to scale Trypticon and Metroplex from Rodimus Prime than Predaking? I point out here - http://www.tfw2005.com/boards/trans...ding-shoulders-giants-part-ii-large-file.html - that Devastator and Omega Supreme are incorrect in season 2, being smaller than Devastator in season 1. Likewise Predaking in the above scan in too small, being only about 2x Rodimus' height. In my chart linked above I scale from the commander/leader character and not the combiner. Either Rodimus is huge or the combiner is small and I went with small combiner. 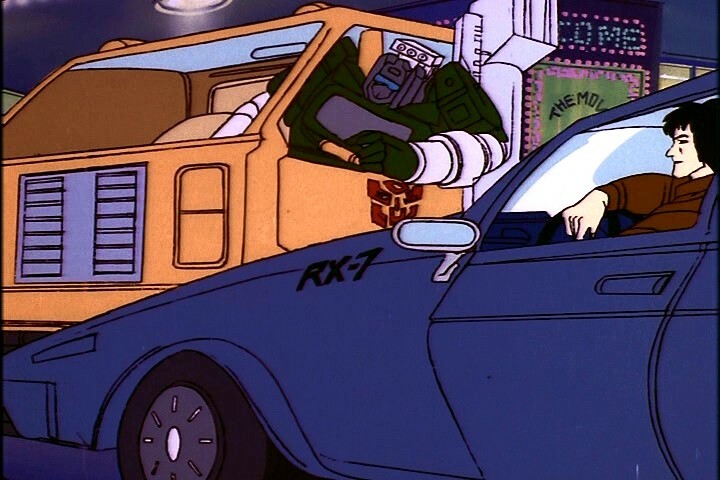 My theory is that for whatever reason combiners had two sizes used in animated media - the cartoon and the commercials. The full size which you used correctly, as does the Season 1 chart and the Headmasters chart, which is about 2.5X leader height. And smaller than 2X leader size, often in commercials. The smaller size could also be for initial combination (I doubt animators wanted to draw parts growing during combination). Predaking is actually shown growing a few seconds after the Predacons already combined in the episode Chaos. Idk, it can't all make sense I suppose. That's fair. I don't think Sunbow had anything to do with Headmasters though. And that's my concern honestly/reason for mentioning it. I think Sunbow itself was only involved with the western/Marvel portion of the franchise. So if you're going by The Headmasters' scale, it'd be wrong to call it the definitive Sunbow scale rather than merely the definitive Japanese scale thread. Rebirth and Headmasters are very different as you point out, so I bring up that inconsistency as for why, I think, the Headmasters scale for nebulans shouldn't be used in a topic about Sunbow scale which would accurately show Rebirth scale as it's the US side. I was only thinking about the actual topic title. Officially yes that's the only scale chart we have for those characters as no Rebirth charts have been made to my knowledge. Could I make a follow up request. I believe that there is some way to do this in excel but I am not sure. What I am thinking is a comparison interactive chart. Basically it would have all the of the names of the characters and you can select 2, 3, 4, etc names from drop downs and then it only shows those characters and no other character. This way if you wanted to see Megatron next Optimus you could. I believe I got an e-mail a bunch of years ago with super models where you chose a name and it showed the picture. So I wonder if that is possible. Also, I got bored, so.